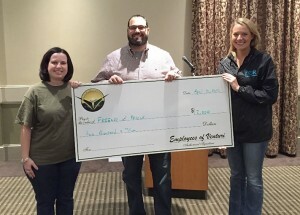 At the first Quarter of 2015 Venturi, Inc. Quarterly Breakfast, the Venturi Brighter Day Employee Fund awarded five grants. 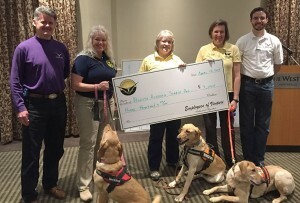 The recipients for this quarter were: Spina Bifida Association of Alabama, Alliance for Opportunity and Development, The Melissa George Neonatal Memorial Fund at Huntsville Hospital Foundation, North Alabama Search Dog Association and Friends of Rescue. 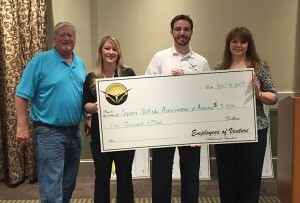 Our first recipient for this quarter, Spina Bifida Association of Alabama use the grant to pay to send 5 families to Camp VIP and provide funds to other Family Connection projects. Above: Steve Hatfield, Tom Mason, and Janet Cosby present Spina Bifida Association of Alabama with a check from Venturi Employees. The second recipient for this quarter, Alliance for Opportunity and Development will use their grant to fund tuition and book expenses of their current AOD scholarship recipients. 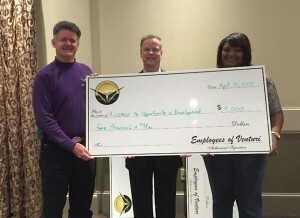 Above: Tom Mason and Sherrye Robinson present Alliance for Opportunity and Development with a check from Venturi Employees. The third recipient for this quarter, The Melissa George Neonatal Memorial Fund at Huntsville Hospital Foundation will use their grant to buy critically needed technology at Huntsville Hospital for Women & Children’s Regional Neonatal Intensive Care Unit. 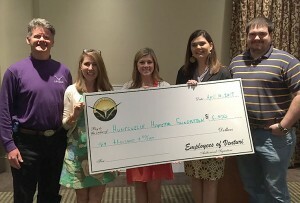 Above: Derek Johns, and Nick Radovich present The Melissa George Neonatal Memorial Fund at Huntsville Hospital Foundation with a check from Venturi Employees. The forth recipient for this quarter, North Alabama Search Dog Association will use their grant to buy a trailer to help transport their new ATV. Above: Derek Johns and Tom Mason present North Alabama Search Dog Association with a check from the employees of Venturi. The fifth recipient for this quarter, Friends of Rescue will use their grant to help dogs and cats in need. Above: Kelly McElroy and Nestor Alvardo present Friends of Rescue with a check from the employees of Venturi.